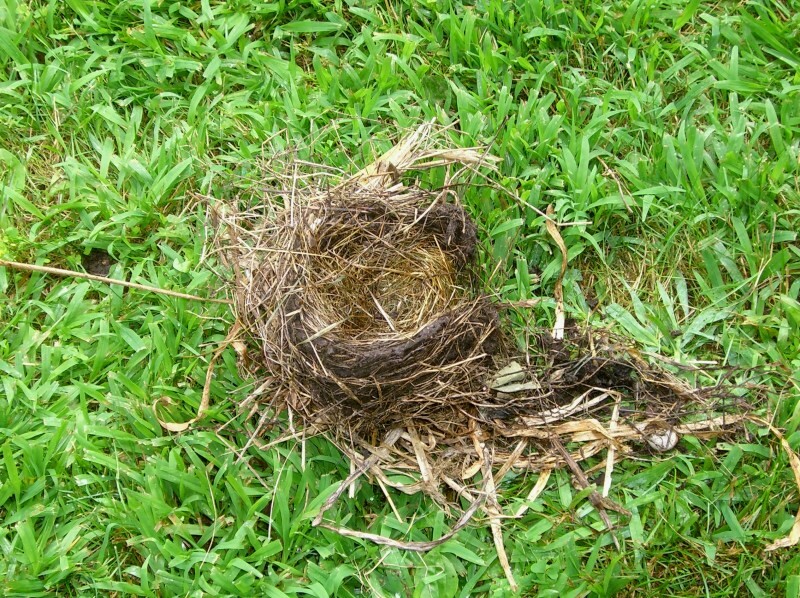 Found a nest in the backyard the other day, after one of the larger rainstorms had come and gone. The rain must have loosened the mud holding the thing together and finally gravity won out. Gravity is strong at this time of year: abandoned nests falling from branches, whole branches crashing down from trees, and the branches that remain lose their leaves. I was looking out the window to our backyard last Wednesday, watching some leaves fall during a brief moment of sunshine. Each leaf fell with no fluttering or side-to-side motion, but straight down and slow, like in a dream. They reminded me of the snowflakes that fell in the first snowfall I ever saw in Boston, the winter of 1980. It was early evening, and I could see the snow starting to fall from my apartment window, so ran outside to investigate. The streetlights were on, and illuminated the large, fluffy flakes as they glided down on a windless night. There is something about an early winter snowfall that makes everything suddenly quiet, and peaceful. Many of the people who passed me by that evening had doubtless seen too many winters of snow and took no notice, but to me the moment was magical, otherworldly, and of ineffable beauty. For the snowflake and the leaf, the fall is inevitable. But even then, a fall can at times be graceful. As Gigi’s buddies on the housing bubble blog predicted, the whole subprime mess has gone to Helena Handbasket, and the median price of a home in the US has dropped for the first time on record. Nervous congress-folk are making noises and passing bills that will make it seem like they are doing something to rescue fools from the consequences of their own actions but the bottom line is that a whole lot of people were fooled (by others or themselves) into thinking they could buy a Maserati house on a Yugo income by playing one great big Ponzi scheme in the real estate/refinance/property flipping/equity loan/ universe. Short of divine intervention, a lot of very unhappy foolish people will be out of a home, out of work, out of credit, out of luck. Recession is all but certain, depression a possibility. The housing bubble has burst and new and used home sales have tanked. Interest rates remain at historically low levels, and will probably be held at that point by the Fed for some time, even in the event of new stagflation. The only thing left on our wish list is for the cost of construction material (lumber, concrete, steel, stone, copper) to come down. Lumber has already gone into decline with the collapse of the residential construction, but the other materials have remained under high demand in the commercial construction business. The 800 pound gorilla in the room is China, which has been eating up all the concrete and steel on the planet the last several years. A lot of this is simply a consequence of a former third-world communist country discovering capitalism and the industrial revolution. At their current rate they are somewhere in the nineteenth century, and robber-barons (with Communist membership cards) are buying limousines and there is a lack of regulatory discipline that would make George Bush jealous. But within a year or two, China will likely also pass through their own 1929, and eventually the anti-materialism backlash of the 60’s and the ecology movement of the 70’s will bring some maturity to their accelerated adolescence. In the immediate future, however, what has been driving a substantial portion of the Chinese construction demand over the last four years has been the 2008 Olympics in Beijing. In addition to the main stadium and the huge new airport, a good portion of the city has been torn down and rebuilt from scratch, all of which requires a lot of construction material. If they stay on schedule, most of this construction must be completed this month so that they will have six months or so to get the “bugs” out of the huge construction projects, and to bring the air-pollution levels down to the point that the participants do not keel over from smoke asphyxiation. Our plans remain to head out to Utah this summer and find a house to rent in Cedar City, 45 minutes from Springdale and just minutes from our architect. For the moment, we are content to wait and see how the construction market goes. In the ideal case, the economy will go south enough that we can afford to build our house for close to the original $125/sq foot estimate we got in 2004, but at any rate, with luck the economy will not be so bad that everybody is out of work and the dollar completely worthless. If it is, then we will both be out of a job along with half the country, and we’ll have a lot bigger problems to worry about than how to build a house. Like, say, how to locate the nearest soup-kitchen. This is of course a totally selfish and unsympathetic attitude to take, regarding events that will cause much suffering. But it was pure and simple greed that was the cause of this whole housing bubble debacle in the first place, causing distortions in the market that rendered our own relatively sane and financially responsible approach to building a house of our own, economically unworkable. We knew we couldn’t afford to build a $700,000 house, and so, instead of getting a subprime adjustable like all the other idiots, we said NO. We are not shedding tears over the rise in foreclosures. The sound of high-fives echo down the hallway of our rental here in Long Beach. All we want to do is to build a nice modest little house in a place that we love, live our lives to the full in that house, and then die happy just before the polar caps turn our Utah property into beach-front. If this requires walking over the bloodied corpses of fools to do it, then so be it. No mercy, no quarter. much like some of Frank Lloyd Wright’s work, but not others. sun and avoid having the room too dark at any one time of the day. in which you feel more alive. — “Little Boxes” Words and music by Malvina Reynolds. what the hell all the people that can afford these things actually do. and then working our way up to a first home.